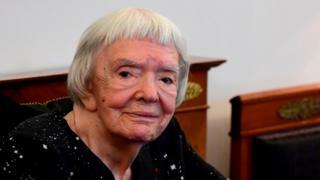 Prominent Russian human rights campaigner and ex-Soviet dissident Lyudmila Alexeyeva has died aged 91. She passed away in a Moscow hospital at 16:30 GMT on Saturday, Russia’s human rights council said. “This is a huge loss for the entire human rights movement in Russia,” the council’s head Mikhail Fedotov said. Ms Alexeyeva became a fierce human rights advocate in 1950s Soviet Union, went into exile and returned to continue her work in modern Russia. In 1968, her activism saw her expelled from the Communist Party and fired from her job at the time. She co-founded the human rights organisation Moscow Helsinki Group in 1976, and within a year its members were arrested, jailed or forced into exile. She emigrated to the US in 1977, where she continued her fight for human rights, until her return in 1993, after the dissolution of the Soviet Union.